Goalkickers: K.Hunter (5), M.Buckley (2), D.Glascott (2), K.Sheldon (1), R.Ditchburn (1), A.Montgomery (1). Best; J.Buckley, K.Hunter, K.Sheldon, A.Montgomery, B.Doull, M.Fitzpatrick. Injuries: D.Glascott (bruised thigh), J.Buckley (bruised ribs) & W.Johnston (broken ankle). 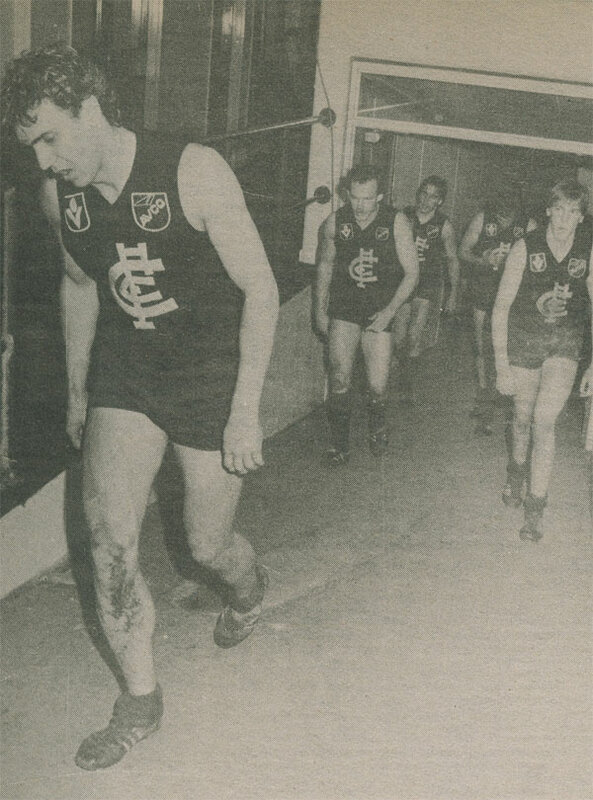 Carlton entered the game without some of its stars, with Bosustow and Bortolotto suspended, Jones omitted, Ashman withdrawing on the morning of the match and Johnston was injured early in the first term. Essendon was not without its problems, with Neil Clarke and Ron Andrews both missing. Essendon controlled most of the match, apart from the second term when Mike Fitzpatrick threw his weight around and distracted some of the Bombers players from going for the ball. A 5 goal to 3 second quarter got the Blues back into the match, but they were unable to sustain the effort and Essendon went on to win by 33 points. It was a shock loss for many Blues fans who always believed that when it came to the crunch against Sheedy and Essendon, the Blues would finally prove that they were the superior team (especially with Essendon losing its past five Elimination finals). But Carlton had finally run out of that 'something' that had led them to 3 flags in 4 years. The loss heralded a short period where the Blues made the finals but were only making up the numbers. In finishing this season, the grand career of Mike Fitzpatrick would also end in his 150th game. Contributors to this page: Grisdesa , Bombasheldon , Jarusa , molsey , AgeofPericles , WillowBlue , steve , stretfordblue and admin . Page last modified on Monday 20 of February, 2017 21:29:54 AEDT by Grisdesa. 1990 Rd 9 - Jezza; this could be the year.